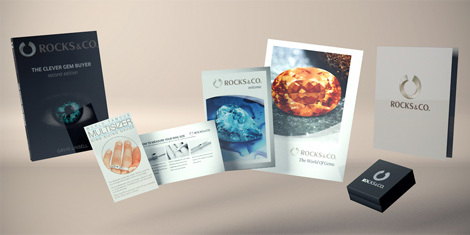 Facts & Figures | Gemstone information at Rocks & Co.
Back Home Gemstone Information Facts & Figures | Gemstone information at Rocks & Co. Devised in the 18th century by Viennese mineralogist Friedrich Mohs, the Mohs' Hardness Scale measures the ability of a gem to resist surface scratching. Mohs quantified hardness on a scale of 1 to 10, with 10 being the hardest and 1 the softest. As the minerals chosen set the levels of hardness, it is a comparative not a relative scale. The hardest natural substance is Diamond, followed by Corundum (Ruby and Sapphire) then Topaz. Developed by Dutch mathematician Willebrord Snellius (Willebrord Snel van Royen) in the 17th century, the refractive index measures a gemstone's brilliance. Critical in gem identification, a gem's refractive index is assessed by using a refractometer to measure the speed and angle of light as it enters the gem. Due to differences in their chemical composition and crystal structure some gem types are heavier than others. Relative density (grammes per cubic centimetre on a 1 to 8 scale) has now largely replaced specific gravity (the ratio of the weight of a specific material to the weight of the same volume of water) as the index used to measure gemstone density. Relative density is what jewellery appraisers use to estimate the weight of gemstones without removing them from their settings. They simply measure the set gem with callipers and then extrapolate an estimate. While you can find a gem's exact weight by removing it from its mounting and weighing the gem on a jeweller's scale, this should generally be avoided. Doing so will expose both the gem and the mounting to increased levels of wear and tear.